Our well appointed villa has everything you need for that perfect vacation in the Florida sun. 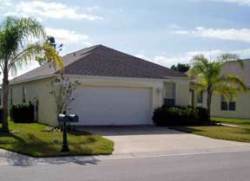 It is located on the prestigious Southern Dunes Golf and Country Club, a gated community only 20 minutes drive from the Disney attractions. The golf course is championship standard, rated the 6th best in Florida, but if you just want to take it easy in the green surroundings, that's fine too. Relax by the private pool, looking southward out over the 17th fairway of the golfcourse. 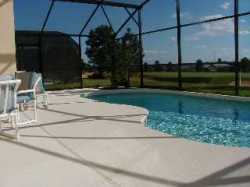 The pool is screened to stop the insect life bothering you, and can be heated for the cooler months. You will not be overlooked by other villas. Inside, the villa is air conditioned. 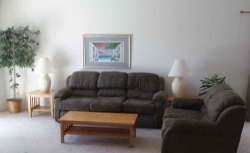 The living room is really spacious, with two sofas, cable TV, DVD and radio/CD systems. The kitchen is fully equipped with all the necessary appliances - fridge/freezer, dishwasher, cooker, microwave, toaster, waste disposal, coffee machine. The master bedroom has a queen-sized bed, TV, radio, ensuite bathroom and walk-in closet. 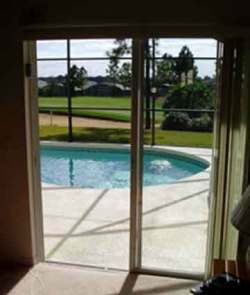 Doors lead straight out onto the patio for that early-morning dip in the pool. The second bedroom also has a queen-sized bed, radio, ensuite bathroom and a large built-in closet. Bedrooms 3 and 4 each have twin beds and built-in closets, and share the third bathroom. Towels, linen and hairdryers (one for each bathroom) are provided. The villa also has a washing machine, tumble dryer, iron and ironing board. "Villa faultless in every way"
"One of the best villas we've stayed in"
"A fabulous holiday, can't wait to come back again"